Roma Moulding CEO, Tony Gareri, is honored to be featured in Toastmaster Magazine! 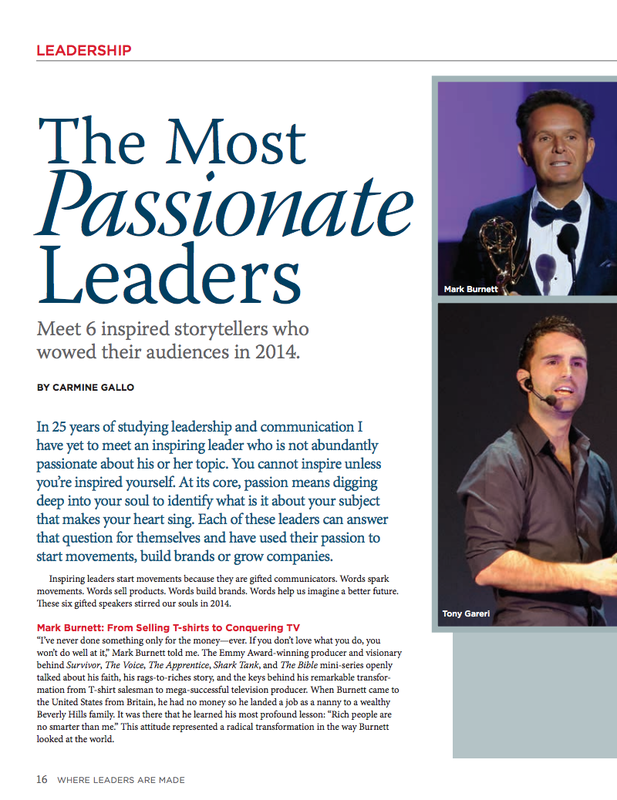 Gareri was identified as one of 2014’s six Most Passionate Leaders, by Internationally renowned author, Carmine Gallo (Talk Like Ted and The Presentation Secrets of Steve Jobs). Since taking over as CEO of Roma Moulding four years ago, Gareri and his team have been on a mission to Move, Inspire and WOW everyone they come in contact with which has created a harmonious and engaged workplace. The results have been outstanding with nine out of ten Roma Team Members recommending the company to friends. The motivated team provides industry-leading customer service that has lead to outstanding partnerships with industry heavyweights such as master photographer, Peter Lik. Recently, Lik set a world record by selling his Phantom photograph for $6.5 million featuring a Roma Moulding frame. Gareri and Lik have worked together for years with Gareri providing customized ways of enhancing Lik’s iconic images. Gareri joined other esteemed leaders on the list including TV producer Mark Burnett, Ice Bucket Challenge creator Pete Frates, Facebook COO Sheryl Sandberg, Cisco CEO John Chambers and Apple’s Senior VP of Software Development Craig Federighi. Gareri and the Roma Moulding team are available for consultation through the Roma Tours programs. Roma Tours opens the company’s doors to aspiring leaders who wish to gain tangible and measurable tactics to improve employee engagement and create a vibrant company culture. Recently, one of Canada’s largest art supplies retail chains visited Roma Moulding to strengthen their partnership while gaining insight into Gareri’s bleeding-edge leadership techniques. Please click here to read The Most Passionate Leaders by Carmine Gallo or click here to be taken to TonyGareri.com. WOW! Holy smokes -way to go Tony and Roma!